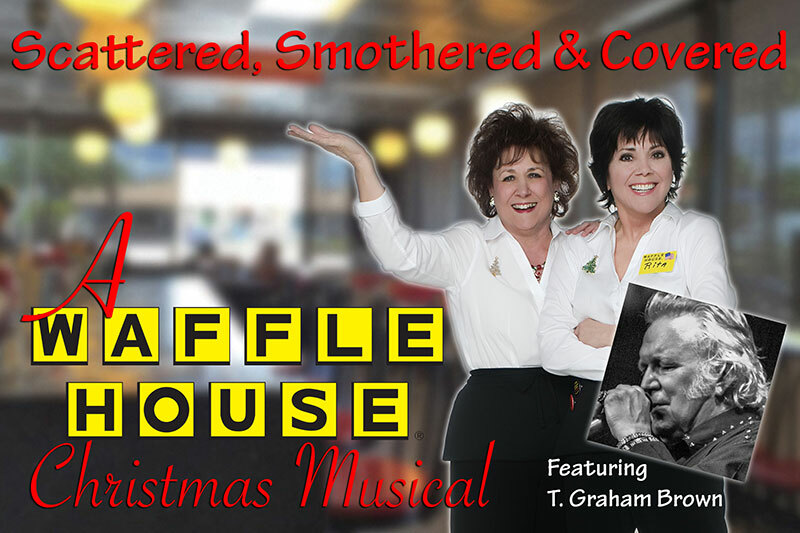 T. Graham Brown And Joyce DeWitt Star In ‘A Waffle House Christmas Musical’ | 2911 Enterprises, Inc.
HENDERSON, N.C. – For one night only, GRAMMY nominated legendary country and soul singer T. Graham Brown will be making his theatrical debut in Kaine Riggan’s ‘A Waffle House Christmas Musical‘ Saturday, December 1st at McGregor Hall Performing Arts Center in Henderson, North Carolina. A down-home style musical to help get you in the Christmas spirit, the production stars Joyce DeWitt (“Janet” from ‘Three’s Company’) and features select members of the original Nashville cast who join local talent. Brown will play the character of Willie Wainwright, a man struggling with alcohol and personal turmoil, and will also deliver a musical performance of his hit song “Wine Into Water.” A Waffle House Christmas Musical is sure to fill your appetite for Christmas fun! Set in a Waffle House on Christmas Eve, the family-friendly musical comedy follows an unlikely mix of characters who are getting snowed in for the night. DeWitt plays Rita, a Waffle House waitress who finds herself in the center of the action and faced with a tough choice after an unusual visit from one of her “regulars”. The show is both hilarious and touching, featuring original music by T. Graham Brown, Randy Travis, and other top Nashville songwriters. The musical was originally commissioned by the Metro Nashville Arts Commission and Southeast Waffles, LLC and first produced at the Nashville Dinner Theater. This one-night-only engagement is the final workshop production. Also this holiday season, fans can find Christmas music with a soulful country sound on ‘Christmas With T. Graham Brown.’ This is his first Christmas album, available at Cracker Barrel Old Country Store locations nationwide and everywhere digital music is found. The project, produced by Brown and Tony Griffith, was released by Mansion Entertainment, is distributed by The Orchard (a division of Sony Music) and can be streamed or purchased here. Ticket to the musical may be purchased at www.McGregorHall.org or by calling (252) 598-0662. DEC 01 – McGregor Hall Performing Arts Center / Henderson, N.C.
.@TGrahamBrown to appear Dec. 1 in #AWaffleHouseChristmas Musical with #ThreesCompany star Joyce DeWitt at @McGregorHall in #Henderson, N.C.